Dr. Shindell was born in Connecticut and moved with his family to Arizona at age 7. He grew up on the “Westside of town”, this being 15th Avenue and Osborn at the time. He attended West Phoenix High School and he still has quite a few friends with whom he attended school. He attended Arizona State University and then went on to medical school at the Medical College of Wisconsin (formerly Marquette). He completed an internship in general surgery at the Medical College of Wisconsin then proceeding to the University of Nebraska Medical Center for residency in orthopedic surgery. He spent an extra two years performing research and has been extensively published in major journals. He chose to complete a Fellowship in pediatrics orthopaedics and scoliosis at Texas Scottish Rite Hospital for Children in Dallas, Texas, this being probably the best pediatric training program. 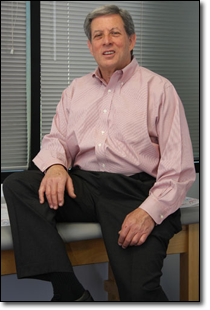 He came to Phoenix in 1989 and was the first to set up a full-time pediatric practice. He has been a member of The Scoliosis Research Society as well as The Pediatric Orthopedic Society and is a Diplomat of the American Academy of Orthopedic Surgeons. He is proud to serve on the Medical Advisory Board of Ryan House, currently being constructed adjacent to St. Joseph’s Hospital with the intention that this will serve as a respite and hospice care center for children with multiple needs. He has served as Director of the Children’s Rehabilitative Services orthopedic program and has served on several committees at both St. Joseph’s Hospital and Phoenix Children’s Hospital. Dr. Shindell has been included several years in Phoenix’s Top Doctors Magazine and was a finalist for the Phoenix Business Journal’s Health Care Hero Award. Dr. Shindell strives to provide the best possible care in pediatric orthopaedics and scoliosis and has tried hard to keep up with the changes in medicine attending several meetings and conferences each year. Dr. Shindell has four children, the oldest of which is working on PhD at University of California San Diego. He has a son who is a high school English teacher as well as having two sons in the arts, one of whom works for a major cartoon company in Manhattan while the other is working on his Masters degree in fine arts. His wife is a working artist in the Phoenix area and has been serving on the Board of Arts and Letters at Northern Arizona University. He is quite proud of his family. On weekends, Dr. Shindell is very active in the local hot rod scene and has built a 1955 Chevy and 1960 Corvette street rod. He is currently building a 1932 Ford two-door sedan street rod which should hit the streets sometime this year. Parents sometimes feel it’s unfair when life deals their children a cruel hand. What would truly be unfair is if life didn’t also allow people like you in the game. We really appreciate your gifts and talents, and even more-so your compassion for Lizzie. Thank you for always making these events easier for her and for us. Thank you for my new legs, now no one can laugh. I am writing this letter to thank you for taking me on as your patient. When I first came to you I had a major problem with my leg. I broke it 3 years ago at a skate park when another skater crashed into me and broke my femur. It broke right on the growth plate and caused it to fuse together and stop growing on one side and caused my leg to become several inches shorter than the other leg. I thought that there would be nothing I could do to fix my leg, but you knew how to deal with problems like mine. You have fixed my leg and saved me from having back problems in the future. The surgeries were fantastically done, with minimal problems. Although the pain could be near blinding at certain times, the results have saved my leg from becoming even more of a problem. Your staff was great in coordinating surgeries and getting me the care that I needed. I appreciate all the x-rays taken by your x-ray technician. There were a lot of x-rays involved throughout this whole process. Overall I really appreciate your staff. Although my recovery was rather long, I do not regret having the surgery done in the first place. I appreciate your services as a doctor and the training you have that allows you to do these complex surgeries. I would recommend your services to anyone else in need of orthopedic surgery. Thank you for giving me my life back! You turned the hunchback little girl into a normal one, and I can’t express how much that helped. You’ve been my advocate for years and not all doctors would have done the same! Now you’ve given me the best Christmas present ever! The gift of being able to walk, run and believe in dreams again. I had given up on a lot of them and now they can come true. I can go hike Camelback Mountain, run a 5K and go horseback riding with friends. You have forever changed my life and I can never thank you enough. You will forever be in my heart, in your own special place! God gave me the best guardian angel, you.